Harvard Design Magazine #38. In the summer of 2014, I saw something shining, almost aflame on a bookstore’s magazine rack. Its cover was neon orange with reflective, embossed Morse code. Half shout and half whisper—readable and unreadable. These wild contrasts, I gathered after picking up the magazine, perfectly fit an issue about the challenges of communication. The revamp debuted at the 14th International Architecture Biennale in Venice. In succeeding issues about family, fear, health, and the ocean, Jiminie’s bold visual system—layouts tailored to types of content, a cover rectangle that’s both window and surface—perfectly complements the bold editorial direction of Sigler’s magazine. Surface #118. I was comically deep in an industrial-design rabbit hole and found myself, sometime in 2015, in lower Manhattan’s furniture mecca Matter. Striped plywood cylinders—drumlike tables by Serbian maker/model Ana Kraš—filled the space. Piled in the back, stacks of Surface caught my eye. 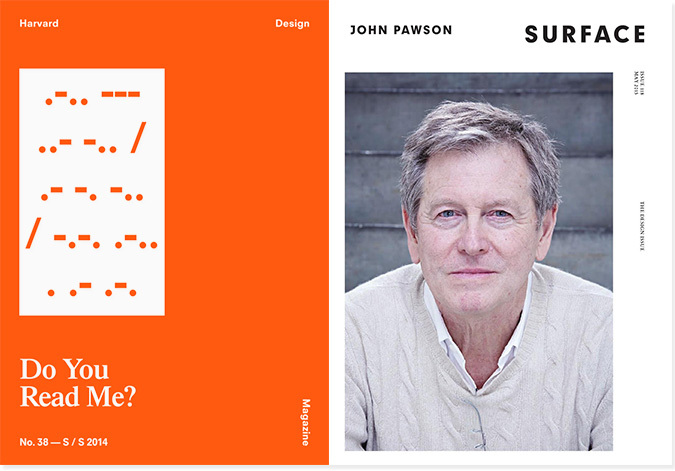 It was issue #118 with John Pawson on the cover. As I flipped through it, the worker on the floor sensed that I was priced out of everything, and gave me a free copy. Back in my hotel room I took a closer look. Gone were the fluctuating, frenzied headlines and the glitzy fashion-mag theatrics of the old covers. Unadorned portraits of creative luminaries graced the new covers. The new Surface felt serene in mood and human in focus. Editor Spencer Bailey wanted to usher real people to the center of deeper conversations about design and the revamp elegantly achieved this. In Jiminie’s world, designers don’t just design. Magazines aren’t just magazines. Studios aren’t just studios. You can be rigorous and constrained and you can be whimsical and liberated. You can be a designer and an artist and a curator. You can experiment and you can perform and you can host. If you feel the same way, you’re not alone. With Projects belongs to a flourishing ecosystem of creators eager to erase—or at least smudge—old lines between fields, mediums, disciplines, cultures.